Today is the one week mark for me being in my apartment and I’d thought I would commemorate this monumental occasion by going for a walk around my neighborhood this morning. I’m not too sore from yesterday’s 13.1 but since I’ve got the Red River run tomorrow, I thought I’d take it easy on the legs today. I live in a part of town called Hyde Park. It’s located north of campus, which is north of the downtown area. In just this past week there are already several things I love about this area. First is that I’m in a prime location to catch a bus to school, to work and to my two best girls’ places. I’m also less than a mile from the big grocery store and blocks from a darling cafe and bakery area. On walkscore.com, this neighborhood scores an 80 out of 100 for walkability which I love and am trying to embrace fully. I hadn’t seen much of the neighborhood except what’s on the bus route until my stroll this morning. It’s got a very Midtown, Memphis feel to me, which basically feels like home. The houses are colorful, the streets shady and my little southern heart sighed with contentment when I saw my first porch swing. And it wasn’t the last. I’m excited to continue exploring the new hood, maybe on evening walks or weekend bike rides. Here’s to hoping I have some free time when school and work really get going! Thank goodness for the porch swings, now I can stay a while (think anyone would mind if I just took a seat for a few minutes….). 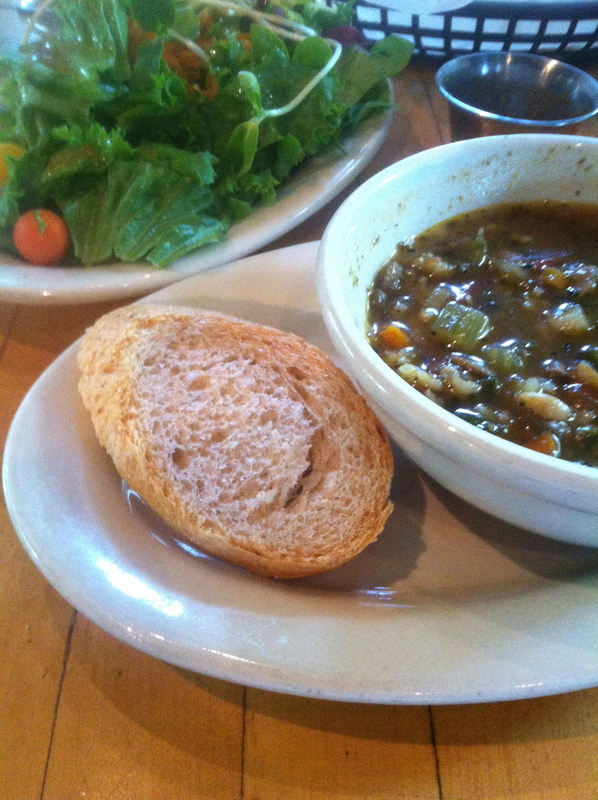 Last week I was asking some Austin friends for recommendations on places to eat in my new ‘hood, Hyde Park. 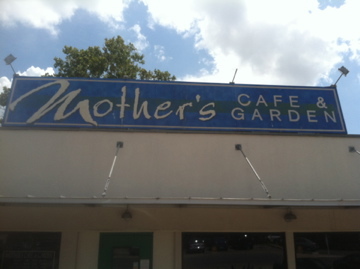 Lynds, the only friend I have who isn’t a transplant (but sadly moved to Tennessee as I left…) suggested Mother’s Cafe. Between the recipe in today’s earlier post and the meal in this one, y’all will be droolin’ for dinner (sorry!). 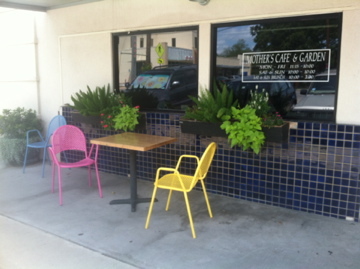 The outside had a colorful entrance with flowers and patio seating but it was definitely too hot to think about eating outside. There was a short wait to sit at a table but within ten minutes we were seated. 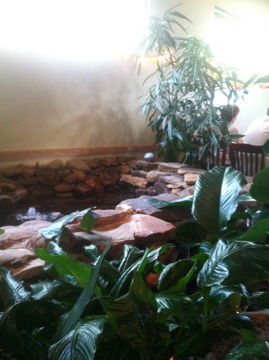 The inside is spacious and in the back room there’s an above ground pond and some foliage (hence the garden in the title I suppose), and we sat right next to it.